There is a paradoxical relationship between the density of solar housing and net household energy use. The amount of solar energy available per person decreases as density increases. At the same time, transportation energy, and to some extent, household operating energy decreases. Thus, an interesting question is posed: how does net energy use vary with housing density? This study attempts to provide insight into this question by examining three housing forms: low-density detached homes, medium-density townhouses, and high-density high-rise apartments in Toronto. The three major quantities of energy that are summed for each are building operational energy use, solar energy availability, and personal transportation energy use. 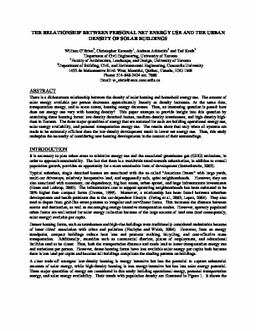 Solar energy availability is determined on the basis of an effective annual collector efficiency. The results show that under the base case in which solar panels are applied to conventional homes, the high-density development uses one-third less energy than the low-density one. Improving the efficiency of the homes results in a similar trend. Only when the personal vehicle fleet or solar collectors are made to be extremely efficient does the trend reverse-the low-density development results in lower net energy.